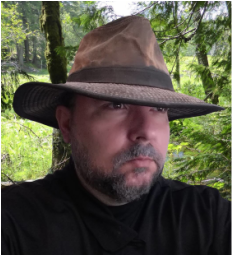 Chief Executive Producer, Assistant Camera (Paranormal) and Sound Engineer - Randy Kovach has lived in the state of Washington on and off since birth. The paranormal, he recalls, has always been part of his life since early childhood. His mother used to use the Ouija Board and practiced automatic writing when he was just a baby. Randy was told by his parents about the numerous times when he was young were he spoke with people that weren’t there, at the time, they assumed they were just imaginary friends. There were also stories about incidents that happened around him and his brothers when they were growing up. He remembers some of the incidents growing up in a haunted location; water facets turning on and off by them selves, toilets flushing randomly, people speaking to them through the walls, objects being moved. It was normal activity at the time to the kids. Through the years he has learned to practice healthy skepticism. He decided he wasn’t going to believe things at face value until he could either prove it or disprove it for himself. Using a variety of investigative tools, both physical and software based, as well as his natural intuitive abilities, he gathers evidence and analyses it with the paranormal group he co-founded; CPRI. There have been many compelling results that are hard to ignore, he welcomes the opportunity to continue searching for the truth.